I mentioned yesterday that I took a bus to SXSW. It conveniently dropped me off two blocks from the venue and afford me a skyline perspective that I usually don’t see — from the north looking south. What I found interesting was the contrast of old to new. Ornate vs. sleek. 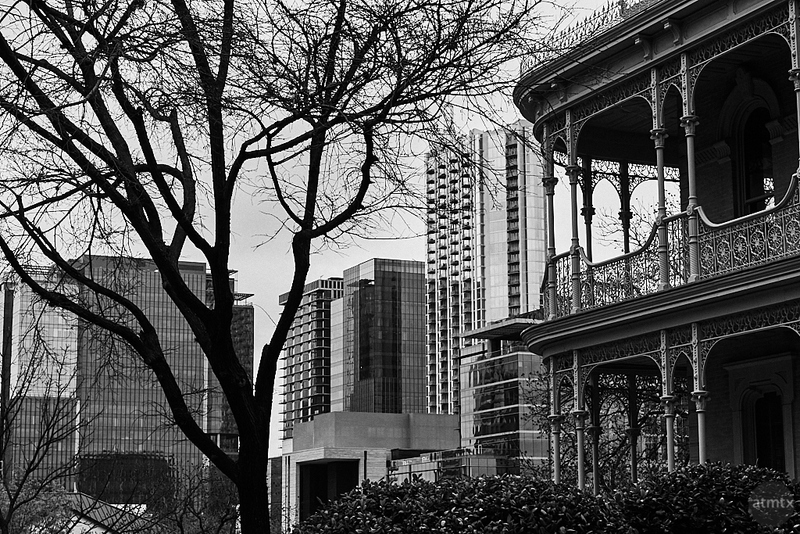 The building in the foreground is one of the few remaining grand Victorians in Austin. The glass clad buildings are courtesy of our latest building boom. Most of the buildings, except of the tallest one, were built within the last two years. I also didn’t realize how much of a slope there is to the river, just beyond the skyscrapers. This Victorian no doubt had a commanding view of a very different and very sleepy Austin, when it was built. I used some telephoto compression to make the skyscrapers loom a little larger. Shot at a 73mm equivalent on my Canon G7X Mark II. It was a very productive though not necessarily exciting weekend. I finished my dreaded taxes, with a week to spare. More importantly for the community, I sent out my first monthly newsletter several hours ago. A friend already gave me positive feedback. It took some effort to put together, though much more enjoyable, creative, and logical than doing the taxes. Along with my first book that launched a couple of days ago, I feel like I’m finally over the hump of planned projects. Now, I can go back to culling my thousands of pictures or even take some new ones. It’s amazing how busy a hobby can be. Want to get next month’s newsletter? Signup here. In the just released April edition, I talked about a new, quite unique camera I bought this year, along with a sample photo. I enjoy your Austin posts as we don’t go there so often except for an occasional Longhorn football game. It is a city that has definitely changed and continues to do so. Hi Lulu, glad you like the little glimpses of Austin. Yes, it is changing rapidly. I almost wish I work downtown, so that I can document it better. I need to go down there more often.